The promise of learning is boundless. The act of teaching should be too. With ActivRemote, instructors can maximize their movement throughout the classroom-collaborating here, collecting insight there-all while still controlling a central computer and ActivBoard. With the push of a button, from anywhere in the classroom, teachers can use ActivRemote to direct ActiVote and ActivExpression voting, advance presentation slides, open applications or web browsers, start movies or command any other software or web browser function that can be made with keyboard shortcuts. It works with any whiteboard and any computer program, but comes pre-programmed (and pre-destined) to work seamlessly, wirelessly, with every part of the ActivClassroom. Just set each of ActivRemote’s seven buttons to execute your most-performed tasks, and connect to the board- and students around the room all at once. 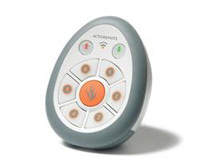 Teachers can use ActivRemote from anywhere in the classroom to direct ActiVote and ActivExpression voting, advance presentation slides, open applications or web browsers, start movies or command any other software or web browser function that can be made with keyboard shortcuts.